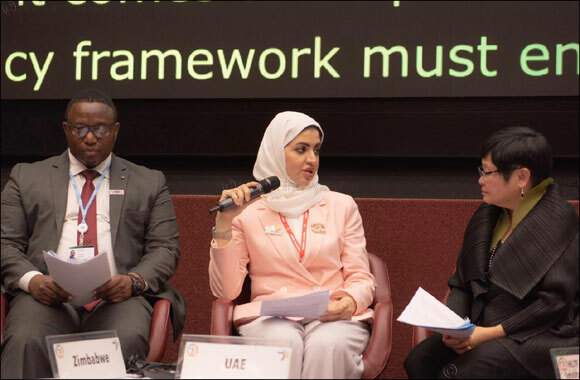 Dubai, United Arab Emirates - April 13, 2019: The Ajman Digital Government participates in the World Summit on the Information Society (WSIS) Forum in Geneva, Switzerland. The event that is running from the 8th to 12th of April is witnessing an international participation from countries, their ministries and organizations that have taken a crucial decision in their governance of ensuring technology and information is always the core of their policies. Ajman Digital Government is part of the UAE delegation representing the country’s achievements in the arenas of IT and Information. The delegation headed by the Telecommunications Regulatory Authority, TRA includes representatives from the Ministry of the Interior, Ministry of Human Resources and Emiratization, the Zayed Higher Organization for People of Determination, Smart Dubai Office, the UAE Space Agency and the Federal Authority for Nuclear Regulation. HE Ohoud Shehail, Director General of Ajman Digital Government who heads the First Digital Government in UAE, awarded by the UAE Pioneers Award for its feat, presented “First Digital Government in UAE- An evolutionary Journey of Ajman’s Digital Transformation”. This transformation is guided by the wide leadership of the Emirates of Ajman and its Vision 2021 that aims for an inclusive society that is the basis of a green economy. She explained that a happy society is the core of our digital services eco-system in Ajman. Speaking also as a panelist at the high-level policy session on “Enabling Environment” HE Ohoud Shehail, pointed out “The typical government centric approach shifting to a customer centric approach is not an option any more but rather a must.” She cited examples of Ajman Ambassadors Network and Ajman Living Lab a customer centric initiative co-designed with the users.